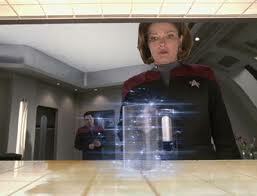 Captain Janeway uses a replicator. “The point is to move beyond your present notion that there are living and non-living states. Your planet and your Sun are alive! And as you progress into the sciences of nanotechnology, nano-biology, and artificial intelligence, new definitions of sentience are sure to come up. What we are doing is jump-starting these concepts and demonstrating their potential. 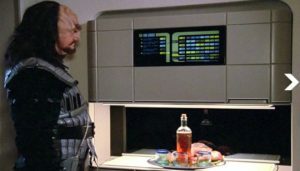 So far we’ve seen several purposes: Replicators allow us to compare both worlds and come to ease with the higher; they serve as a bridge between our civilizations and lifestyles; they broaden our knowledge of sentience; they develop our latent mind abilities/telepathy; and they help blend our technologies. 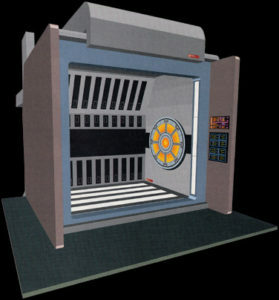 So there is much more to the use of replicators than meets the eye. They’re one among a number of entrées into galactic society. Eventually we won’t need scout ships to travel, free energy devices to power up, or replicators to create food. We’ll be able to travel instanteously and create what else we need. (1) “In the Midst of Great Transition: The Arcturians through Suzanne Lie,” April 20, 2017. at goldenageofgaia.com/2017/04/20/in-the-midst-of-great-transition-the-arcturians-through-suzanne-lie/. (7) Sheldan Nidle, Apr. 27, 2010. (5) “Transcript: Heavenly Blessings ~ Commander Ashira Returns for a Further Discussion on Galactic Life,” channeled by Linda Dillon, March 25, 2014, at goldenageofgaia.com/2014/03/30/transcript-heavenly-blessings-commander-ashira-returns-for-a-further-discussion-on-galactic-life-march-25-2014/. (1) “Transcript: Universal Mother Mary Discusses the Law of Completion and Continuity on Heavenly Blessings,” channeled by Linda Dillon, December 3, 2013 at goldenageofgaia.com/2013/12/universal-mother-mary-discusses-the-law-of-completion-and-continuity-on-heavenly-blessings-december-3-2013-2/. (2) Loc. cit. (5) SaLuSa, Nov. 14, 2011, at www.treeofthegoldenlight.com/First_Contact/Channeled_Messages_by_Mike_Quinsey.htm . so, like, it replicates weed, right?